HFT is Dead. Long Live HFT. The commoditization of speed is also another main point in the piece. One HFT executive is quoted as saying “We don’t necessarily value absolute speed as much as relative speed.” The article implies that speed is no longer the determining factor in HFT. 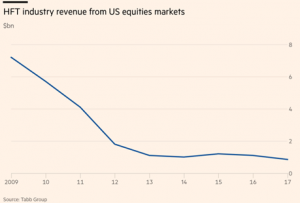 Average readers may come away from reading this piece and think that HFT is dead but regular readers of the Themis Trading blog know that this is not true. In fact, our friends at IEX just published a piece titled “Incentivizing Trading Behavior Through Market Design” which takes a very close look at the speed games that are still going on in the equity market. We agree with IEX and believe that the recent US Court of Appeals ruling in the City of Providence, et al. v. BATS Global Markets, Inc. case could possibly convince the exchanges that they need to change their practices. The court ruled that “exchanges are not entitled to absolute immunity” which opens the door for numerous class action lawsuits filed by investors against the exchanges to proceed and could result in millions of dollars in damages against the stock exchanges.